"LANDLORD AND TENANT BOARD EVIDENCE"
"Read These 3 Pieces of Key Evidence and You Be The Judge"
We provided so much evidence proving that this eviction should have been dismissed. Right from the very beginning on the Notice of Termination, Marineland stated that we would only receive the $3,000 Compensation if we cleared our land and removed our homes. I proved to the Landlord and Tenant Board that this is not true. I proved that the compensation required must be paid before he can obtain the eviction. I also proved that the $3,000 Compensation was enacted into law in the early 70s and has never been indexed according to inflation. It states in the Residential Tenancy Act that the Adjudicators could have awarded us more at their discretion. It also states in the Residential Tenancy Act that if the Landlord misleads the tenants as to their rights, the application may be dismissed. Both Adjudicators Member Elizabeth Beckett and Member Shirley Collins only ordered Marineland to pay 7 people $3,000 Compensation. So 40 Families received no compensation saving Marineland at least $120,000. They also ignored the fact that these tenants were misled and allowed the notice of termination. if the landlord seeks to communicate other messages in the form which are misleading about the tenant's rights or inconsistent with the provisions of the RTA, this may cause a Member to find it defective. Information may be provided which is not misleading, is not inconsistent with the law and does not confuse the essential information in the Notice. 2. $3,000 or the prescribed amount, whichever is greater. 2006, c. 17, s. 164 (2). We stated from the very beginning that if Marineland intends to take our homes and build Maintenance Support Buildings on this property they are required to obtain building permits. Marineland even stated in their Notice of Termination that they would obtain these permits prior to eviction. We provided Letters from City of Niagara Falls and the Conservation Authority since the lands in question are considered wetlands proving that they have not even applied for any permits. According to Section 73 of the Residential Tenancy Act the board could not evict us until they have obtained these permits. Section 73 of the Residential Tenancy Act was put in place to protect tenants from unscrupulous landlords whom may be evicting you from your home for no reason. This was our protection that Marineland was going to do what they stated in the Notice of Termination. Both Adjudicators Member Elizabeth Beckett and Member Shirley Collins ignored our pleas for Marineland to obtain these permits that are required. (ii) has taken all reasonable steps to obtain all necessary permits or other authority that may be required to carry out the activity on which the notice of termination was based, if it is not possible to obtain the permits or other authority until the rental unit is vacant. 2006, c. 17, s. 73. 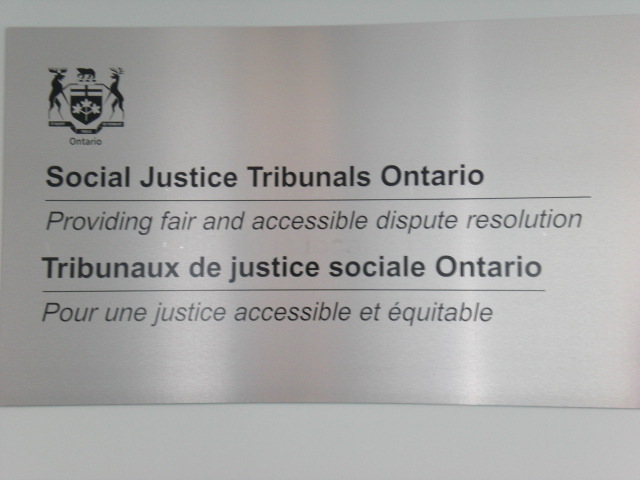 We then went back to the Tribunal exactly 1 year later and filed for Bad Faith since Marineland has done nothing with the homes in the park since we have left. We had pictures of the trailers in the same state as when we left them. We had updated letters from both the City of Niagara Falls and the Conservation Authority stating that they have still received no applications from Marineland in regards to this land. This should have been a hands down WIN for Bad Faith. Marinelands evidence was that they did clean up some of the remains on the property that we tenants left behind. This falls under the City bylaw property standards and they are required to clean up any debris. Marineland also submitted a picture of a piece of heavy equipment that was broke down. So a Multi-Million dollar company could not continue demolition because their machine broke down????. Also, just a note but the date stamp on the picture was for the year 2005. They laughed and claimed the battery went on the camera. Marineland also submitted a email exchange between Tracy Stewart (Marinelands Administrator) and Enbridge Gas in regards to disconnecting the gas to the property. I challenged the validity of this email since it was clear that it was copied and pasted and was not the original document. It was fraudulent. And more so, when the judge asked them about it they swore that it was true. I later proved that they changed the date on one of the emails which more than proved it was tampered with as evidence. This would now be perjury. The Adjudicator ordered in their favor. I will be updating this in the next couple of weeks with all our evidence and the orders from the Landlord and Tenant Board. Everyone will now be able to see and judge for themselves as to what happened to us. It is very clear to us that there is more to this that we are unaware of. You will see what POWER AND MONEY CAN ACCOMPLISH!!!! While you are reading our statements keep in mind that in all cases Member Elizabeth Beckett and Member Shirley Collins awarded in favour of Marineland of Canada, disregarding all of our evidence???? ?